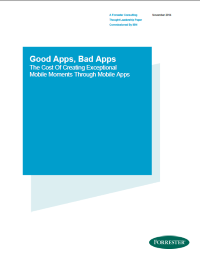 In August 2014, IBM commissioned Forrester Consulting to examine the impact of “good” or “bad” mobile applications on a company’s brand, revenue, and cost structure through primary research and to create a cost framework and model. enterprise and consumer perspective. Download the report today to find out the ten key cost drivers to develop and deliver a mobile app.